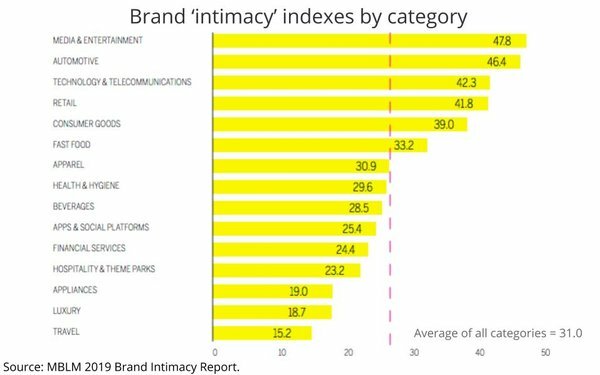 Media remains the most "intimate" category in terms of how consumers connect with its brands. That's one of the top findings from the just-released 2019 edition of "intimacy agency" MBLM's "Brand Intimacy Report." The report, which analyzes the emotions of 6,200 consumer respondents across 56,000 brand evaluations covering 15 industries, found the media and entertainment category ranks No. 1 with an index of 47.8, 1.4 points higher than the second most intimate brand category, automotive. The average intimacy index of all categories was 31.0, with travel ranking last at 15.2. The media category's strength is reflected in the study's top overall rankings, with Disney ranking No. 1, Apple No. 2, Amazon No. 3, Netflix No. 5, Sony Playstation No. 7 and YouTube No. 8. The study also reveals that when it comes to national populations, the U.S. has one of the lowest overall shares of intimacy with brands. 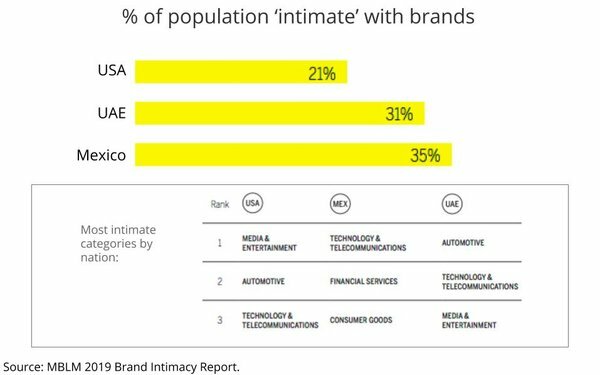 Only 21% of the U.S. population is deemed to be "intimate" with brands vs. 31% for the United Arab Emirates (31%), and Mexico (35%), two other nations represented in the report. The finding is consistent with other global consumer branding studies, especially Havas' "Meaningful Brands," which historically find Americans are disproportionately more discerning than other cultures, partly because they have so many more brand options to choose from.